It is a substantial work lasting over twenty minutes. A short Introduktion leads to the Adagio, followed by Allegro di molto and the final Choral. The Introduktion starts with the violin alone, intense and thoughtful with occasional comments from the string orchestra. The mood continues into the Adagio, becoming a still more intense dialogue between soloist and ensemble. The third movement, Allegro di molto starts rhythmic, hard edged in the strings, and a vibrant energetic solo with the two engaging in another tense dialogue which is far edgier and faster than the previous movement. The violin writing is bravura, and leads to a cadenza which is followed by a quieter more thoughtful concluding section. The final movement Choral is based on a funeral march for the victims of the Russian revolution. It is a profoundly beautiful movement, the lyrical violin part full of singing anguish, and ending aetherially. Polish, Jewish, Myeczyslaw Steinberg (1919-1996) was born in Warsaw and studied at the Warsaw Conservatory. Fleeing when the German troops arrived in 1939, he arrived in Minsk and finally ended up in Tashkent. Contact with Shostakovich led to his moving to Moscow and the two remained friends and Steinberg's music holds elements of influence from this friendship. His Concertino was written in 1948 at a time when his father-in-law, the celebrated Yiddish actor Solomon Mikhoels, was murdered on Stalin's orders. For some reason, there is no record of the work being performed during Steinberg's lifetime. In three movements, the opening Allegretto cantabile is based on a singing, lyrical melody which is rather fascinating and not a little wandering in style. There is a lovely charm to the piece, with a wistful yearning. The middle movement starts with a dramatic cadenza, followed by a lyrical melancholy Adagio with hints of Shostakovich like wit. Linus Roth plays seductively, with fine grained elegant tone. The final Allegro moderato is an elegant dance with a busy violin part and the focus is very much on the soloist leading to a bravura conclusion. And here too there are hints of Shostakovich. Finally we hear Linus Roth and Jose Gallardo in Shostakovich's austere movement from his Sonata for Violin and Piano, written in 1945 and never finished. A terrific end to a terrific disc. 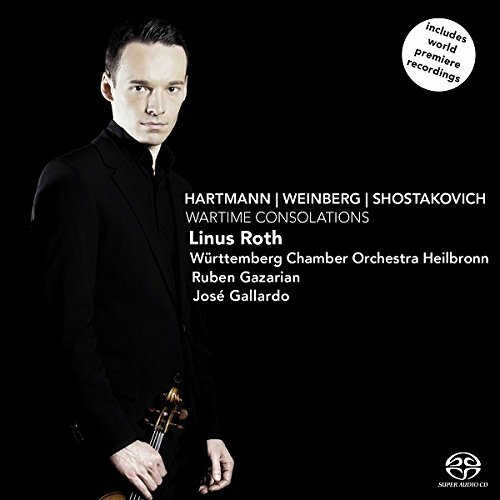 The music on this disc deserves far wider currency and in Linus Roth's performances the works have a powerful advocate. Possessed of a fine-grained singing tone with a real inner strength, Roth also has the requisite technique in addition. His is superbly supported by Ruben Gazarian and the Wurttemberg Chamber Orchestra Heilbronn.